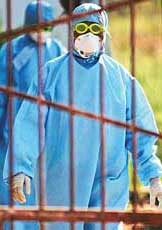 Gujarat is on high alert with cases of bird flu reported in Nandurbar district of Maharashtra, bordering the southern part of the state. According to the state Animal Husbandry and Health authorities, provisional checkposts have been set up all along the Gujarat-Maharashtra and Gujarat-Madhya Pradesh border to monitor the movement of humans as well as poultry and meat products. Are you satisfied with the preparations to deal with the threat of bird flu? The Animal Husbandry Department of Maharashtra today said more than eight lakh chickens had been culled in Navapur tehsil of Nandurbar district where bird flu was detected. The government had given orders to exterminate all chickens in the tehsil. All fowls, including broilers and country chicken, are being exterminated. This is the fourth instalment of readers' response. Officially admitting to the “operational secret” of using militants to counter other militants, the Director-General of Punjab Police, Mr S.S. Virk, today admitted to the existence of Sukhwinder Singh Sukhi, a former militant, who was earlier declared dead in an encounter with the police. Seven Army personnel have been convicted for cowardice for lapses which killed a Brigadier and nearly annihilated the Northern Command top brass during a terrorist attack at an Army camp near Akhnoor in July 2003, it is learnt. The Defence Ministry has asked the CBI to probe “war room leaks” of the Naval headquarters that led to the sacking of three senior Naval officials. A student was raped by her school teacher Rajesh Kumar at Chudiala village last evening. The girl was again raped by a youth who witnessed the earlier incident. According to Mr K.K. Khandelwal, Director General, Secondary Education, Haryana, Rajesh Kumar has been suspended. 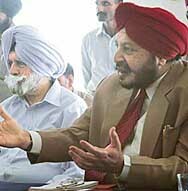 In a significant development, the Coordination Committee of Vice Chancellors, has decided to enforce UGC/state government's norms while selecting Principals, lecturers in all the DAV Colleges, thus ending their 'minority status', enjoyed by the management in Punjab for the last about 35 years.